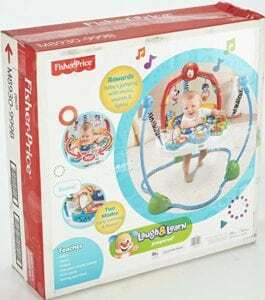 The Fisher-Price Laugh & Learn Jumperoo is a fun and exciting baby jumper that uses music, sounds and lights to interact with your baby. It is a great product to encourage learning and development for your baby, while utilizing fun activities to promote such growth. This Jumperoo has two modes to choose from, a Musical Fun Mode and Early Learning Mode, to assist your baby in learning vital early-life lessons. The Fisher-Price Laugh & Learn Jumperoo is a trusted and well-known product that will give you comfort in knowing your baby is kept safe while they are playing and learning new things. There are so many things for your baby to discover on the Laugh & Learn Jumperoo! The Fisher-Price Laugh & Learn Jumperoo is a made up of a combination of polyester and plastic, supported by a metal frame. The number one priority for parents is to keep their baby safe. Fisher-Price allows you to feel confident in their product by creating a safe environment for your baby to play in. You will find comfort in knowing the frame is made of steel which provides a strong and stable base, so your baby will be kept safe while using this product. Unlike some other jumpers, this Jumperoo is completely stand-alone, eliminating the need for doorway support. This will give you peace of mind as your baby can be anywhere you are. The footings are also covered with non-slip material so you won’t have to worry about the Jumperoo sliding around on hardwood or tile flooring. The springs on the Jumperoo are also covered to add protection for tiny fingers. The polyester and plastic provides soft and flexible textures allowing your baby to have maximum comfort while using the Jumperoo. They also provide you with durable surfaces that are easy to clean. Another great bonus is that the removable seat pad is both machine washable and dryer safe. The interactive farm animal themed features include a bat-at rooster, flip book, veggie shape sorters, rattle bead cow, peek-a-boo horsey, clacker kitty, pop-and-play piggies and a mirror pond. There are six toy stations and two hanging toys that your baby can explore. Every time your baby activates one of these toys, they will be rewarded with a sound or light. For example, if you baby plays with the flip book, something different will happen every time they flip a page. By offering these fun rewards, your baby is encouraged to continue to explore and see what else is available. They will be pleased to learn that the fun never stops and you will be pleased to know your baby is not only having fun, but learning as well. As your baby discovers each feature, they will interact with lights and five cheerful songs. The melodies include Farmer in the Dell, Hey Diddle, and Mary Had a Little Lamb. The colorful toys, exciting sounds and musical functions aid in stimulating your baby’s visual and auditory skills. They will absolutely love bouncing around in this Jumperoo! 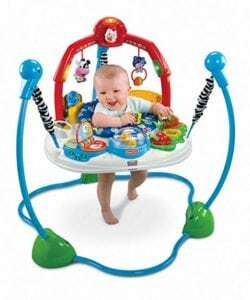 The Jumperoo comes with two modes – Musical Fun Mode and Early Learning Mode. In the Musical Fun Mode your baby will enjoy short-play music that will be activated as they explore the interactive features on the Jumperoo. You also have the option of continuous-play music that is filled with fun lights and sounds! In the Early Learning Mode your baby will enjoy sing-along songs as well as spoken words to provide exposure to animal sounds and first words. The music, lights and sounds offer rewards and encouragement for your baby as they are eager to discover more. By exploring busy activities, your baby will learn cause and effect – allowing them to learn how to make things happen. Your baby will be introduced to so many new things and their developing senses will be enhanced during this process. Available languages include English, French, Spanish and Mandarin. Your baby will be able to jump and spin in a 360-degree rotating and bouncing seat. This will allow your baby to develop motor skills by discovering the different types of movement the Jumperoo has to offer. There are three springs attached to three extenders that provide support and stability while your baby plays. The frame also adjusts to three different heights, allowing your baby extended time to play as they grow. The maximum weight suited for the Jumperoo is 25 pounds. The Jumperoo is 32.5 x 32.5 x 31.5 inches and weighs 17 pounds. Three triple-A batteries are required for the light and sound features. If you are looking for a baby jumper that will provide a safe and fun environment for your baby, then the Fisher-Price Laugh & Learn Jumperoo is a great option for you. You will find that the sturdiness and stability of its steel frame will give you comfort knowing your baby is well taken care of. The non-slip footings will provide additional stability. A major plus for this Jumperoo is that it is a stand-alone jumper, so no door frames are necessary. You will also get more use out of this jumper as your baby grows because it comes with the ability to adjust its height – so as your baby grows so will the jumper! It will not only keep your baby safe, but also provide enhancement of developing senses including visual and auditory skills. Your baby will be provided with a variety of activities that help stimulate their learning ability. You can also choose between two modes, the Musical Fun Mode and Early Learning Mode. The option between the two modes gives you flexibility in how your baby will learn while using the product. Your baby will get exposure to new lights, sounds and music with every interactive feature. The farm animal theme is a playful way to get your baby intrigued and excited about discovering new activities. Your baby will love jumping, spinning and bouncing in this Jumperoo! You will love watching your baby grow and have fun while also learning many new skills. The Fisher-Price Laugh & Learn Jumperoo is a wonderful option for you and your baby to enjoy.